Workin’ It!, the new book from world-renowned recording artist, television host, and drag queen RuPaul, provides helpful and provocative tips on fashion, beauty, style, and confidence for girls and boys, both straight and gay—and everyone in between! No one knows more about life, self-expression, and style than the host of the hit LOGO series "RuPaul’s Drag Race," and Workin’ It! picks up right where the show leaves off. More than just a style guide, Workin’ It! is a navigation system through the bumpy road of life. Let RuPaul teach you the tried, tested, and found-true techniques that will propel you from background player to shining star! 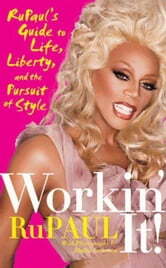 Books related to Workin' It! Loved it! Rupaul offers authentic, practical and kind advise. His life lessons are simple, yet transformative. And he delivers it all to his readers with his legendary, glamazon style! For the brave of heart ! More! Pretty please, RuPaul ... Bravo ! I liked the pared-down and honest chat style. A humanist triumph and gorgeous guy who talks with women like he means it!